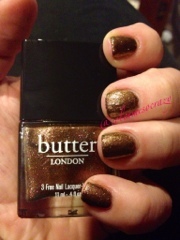 A little tab of Butter London for me to step down! So, my job is sucking the life out of me and I have to downgrade on my posting :( instead of every day, I will be posting 2-3 times a week. I am in the middle of 2 challenges, sucking-the-life-out-of-me job, 2 kids and a low buy!! 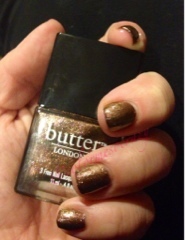 But as a boo hoo present for my downgrade I am giving you my first Butter London- Scuppered! I have been NEEDING this color in my life!! First, Scuppered is probably one of the best words to use when you don't know the right word. Second only to "scragging". I use scuppered, scupper, scupped, scup, etc. frequently! 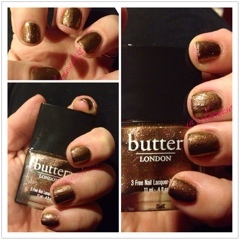 Enjoy the new found vocabulary along with the beauteous color from Butter London! !